What a lovely weekend we had! Too bad this rain had to step in and ruin things...but let's not get all down and out. SPRING IS HERE! Oh, and it's Marathon Monday, so put on a rain jacket, tell your boss you're going to get a coffee, and go cheer on some badass peeps. Or, watch the livestream from your computer and minimize it when he walks by. Anyhoo, here are some of the week's must-read links to keep you in the know. If you're reading this I assume you probably aren't running or cheering downtown, but here's how you can take part and watch the beloved Boston Marathon from your computer. If you want to stay indoors, here's a great list of bars along the route. And if you're throwing on a jacket, here's a pro's list of mile markers to watch from. 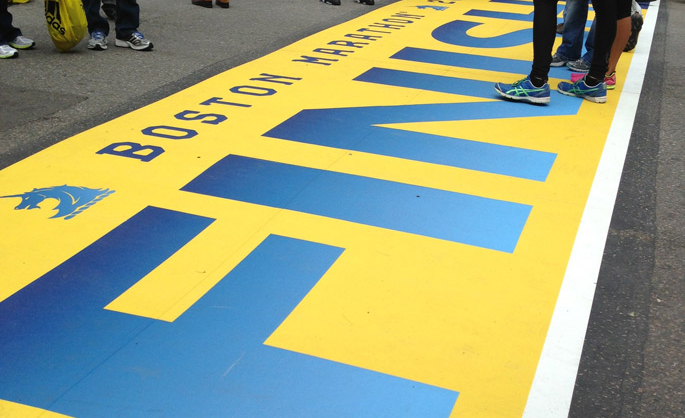 Um, all these celebs have beaten me just by RUNNING the Boston Marathon. Props to all of them. And everyone else running today! The White House's new social secretary, Deesha Dryer, has a shocking background compared to those who previously held her position. Her career and life motto: just keep going. A must-do for everyone: learn your self worth. Second on that must-do list: remember that a resume is NOT a eulogy. An app that helps you avoid toxic friends. At first I was like, "LOL," but now I'm like "need that!" I just discovered Make Space and I am thinking this is EXACTLY what I need to clear my apartment of unnecessary clutter, and my winter coat that I never want to see again. I guess this MMCB had a theme of "you're worth it" / "you can do it," but I'm ok with it. Let's tackle this week!